James Patrick Major born in Fayette, Missouri, grew to 6 feet 4 inches tall with gray eyes and brown hair, surely an imposing figure. He graduated from the U. S. Military Academy in 1852, twenty-third in his class. He was a second lieutenant serving in the Texas frontier when in October, 1858 he battled the Comanches at Wichita Village for which he was commended. He shortly married Eliza Chalmers. They had a son and a daughter. Eliza Chalmers was a sister-in-law of Confederate Gen. Thomas Green. In March 1861, Major resigned from the U. S, Army and shortly was in the Confederate States Army. In 1862 as acting artillery commander, he helped repulse an attack on Vicksburg. 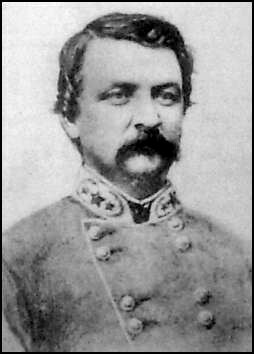 Gen. Richard Taylor recommended James Major's promotion to Brigadier General and he was promoted on July 21, 1863. He served under Gen. Green during the Red River Campaign and apparently was promoted to Major General after that campaign, although it may never have been officially recorded due to the war's end. A passport application to travel to England and Europe in 1871 has him traveling with his wife, minor son and maid. 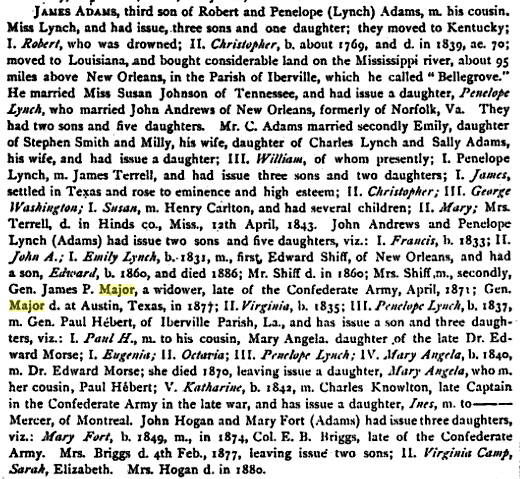 Major's second wife, Emily Lynch Andrews, is the granddaughter of Christopher Adams and Susan Johnson. After moving to Louisiana, Christopher bought considerable land along the Mississippi River that became known as Bellegrove. Christopher Adams' son-in-law, John Andrews had the home built which was known as Belle Grove Plantation located just outside of White Castle, La. The home was completed in 1857. 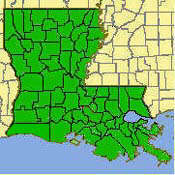 Major is the brother-in-law of Louisiana Gov. & CSA Gen. Paul O. Hebert, who is buried in St. Raphael Cemetery outside of White Castle. They married two of the Andrews' sisters. In 1871 James Major married Emily Lynch Andrews, the widow of Mr. Schiff. Maj. Gen. C. S. A.
died 10th April 1848. aged 35 years & 34 days. died 13th Oct. 1836. aged 1 day. died 2nd March 1851. aged 6 years & 79 days. Father John M. T. Massardier.